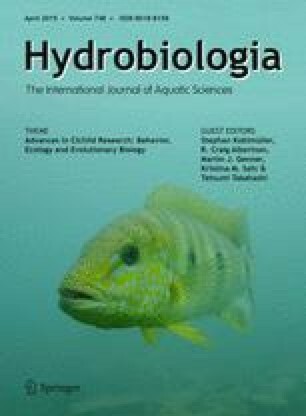 Intra-specific morphological variation in the cichlid Tropheus duboisi from 10 localities over its entire known distribution area along the central eastern and northern shore of Lake Tanganyika was investigated. This revealed significant differences between various populations that are geographically isolated. These morphological observations only partially correspond to the results of a haplotype network, based on mtDNA. In addition, a difference in the timing of the onset of the adult colour pattern was discovered for one isolated population. The occurrence of morphological intra-specific differentiation is discussed with respect to the basal position of T. duboisi within Tropheus as well as to the presumed morphological stasis of the genus. The online version of this article (doi: 10.1007/s10750-013-1692-5) contains supplementary material, which is available to authorized users. We would like to thank C. Gillardin, J.A.M. Raeymaekers, D. Muzumani Risasi, T. Mulimbwa N’sibula, F. Muterezi Bukinga, V. Nshombo Muderhwa, J. Mbirize Ndalozibwa, A. Avenant-Oldewage, A. Pariselle and S. Risch for assistance during sampling, S. Loix for assistance in the lab, F. Van den Broeck for software support and T. Musschoot for creating the map. We would also like to thank M. Parrent, M. Schreyen (Fishes of Burundi), G. Ntakimazi (Université du Burundi), Ad Konings and H. Büscher (University of Basel) for their help in preparing this manuscript. MVS is a PhD fellow of the Research Foundation—Flanders (FWO—Vlaanderen). Fieldwork was partly funded by a travel grant from the King Leopold III Fund for Nature Conservation and Exploration. Felsenstein, J., 2005. PHYLIP (Phylogeny Inference Package) Version 3.6. Distributed by the author. Department of Genome Sciences, University of Washington. http://evolution.genetics.washington.edu/phylip.html.